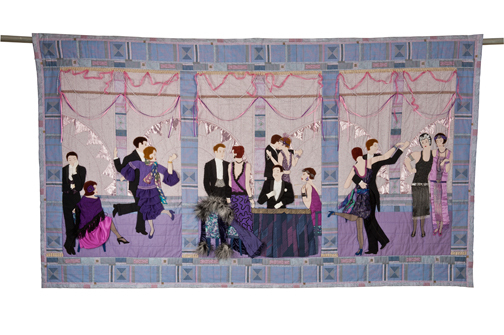 A 1920's night club celebration scene with couples dancing the Charleston. 47" x 82". RELIEF APPLIQUE: THE PICTORIAL QUILTS OF CAROL GODDU. "In ten years of pictorial quilting my subjects have taken me across the centuries, to exotic lands, and into the realms of dance, theatre and fairy tale and myth. This book is a record of my journey." writes Carol Goddu in the introduction to RELIEF APPLIQUE. The journey is illustrated here in 85 colour plates showing 20 of Carol's works including Anything Goes, portraits of Henry VIII, Lady Jane Grey and Elizabeth I, a depiction of Peter Pan, a Russian Fairy Tale and an Arabian Nights Fantasy. This introduction to pictorial applique in the third dimension also includes two explanatory appendices allowing readers to see step by step how Carol constructed two of the quilts illustrated in the book. RELIEF APPLIQUE: THE PICTORIAL QUILTS OF CAROL GODDU was published and copyrighted in 1991 by Night Owl Press. ISBN 0-9695312-0-6. RELIEF APPLIQUE: THE PICTORIAL QUILTS OF CAROL GODDU is available from Night Owl Publishing for $30. Send your cheque or money order to 1166 Whiteoaks Avenue, Mississauga, Ontario, Canada, L5J 3B5.